What kind of community is Trinity? At Trinity, we’re a lot like most church communities: very human! We come from different political and theological perspectives; we have a variety of opinions about almost every subject. We strive to remember that it’s Jesus Christ who makes us into a community and is the source of our unity. We can laugh at ourselves, most of the time; we make mistakes; we give and receive forgiveness. Many of us have found deep and meaningful friendships with others here. Some of our passions are: music and worship, social justice (both local and global), and caring relationships between people of all ages. Like many church communities, we also love to eat and talk together. No. You won’t be asked to stand or identify yourself as a visitor during the service. We know that you may want to get a feel for the congregation before sharing personal information. However, we do want you to feel free to introduce yourself to the pastors and to people around you. 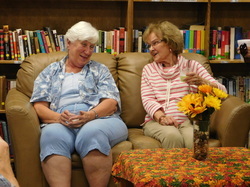 On Sundays, “hospitality” members are there to greet guests and visitors in the narthex (lobby) of the church building. We also have “Welcome to Trinity” cards in the pews that you’re invited to fill out if you’d like us to contact you. Children are welcome at Trinity! God’s children of all ages are welcome in worship; but we do provide a few options to help support parents/caregivers of little ones. We have activity bags available just outside the worship space for kids to take into worship, and a “children’s library” where kids and adults or nursing moms can step out for a moment if desired and still hear and see the service. If you prefer, we also offer a staffed nursery during our Sunday 10:30 am service where kids 0-5 will enjoy a Bible story and craft or activity. Outside of worship, Trinity strives to provide educational and faith-forming opportunities for every age. Middle and High School Youth Ministry is coordinated through Fort Collins Lutherans (FoCoLu). FoCoLu is a cooperative effort of ELCA churches in Fort Collins to partner together. At present we are joining together in the area of youth ministry in events, classes, and service. Please visit the Fort Collins Lutherans website to access these resources! At Trinity, we believe that it is Jesus Christ who invites us all to the Communion table. All Christians of every tradition are welcome to receive the bread and the wine (or non-alcoholic juice.) Gluten-free bread is available upon request. A blessing is also available for those who choose not to receive Communion, and our communion servers are happy to come to you if you have mobility trouble. Our ushers can assist you with any of these special needs. Is Trinity connected to the wider community? Definitely! 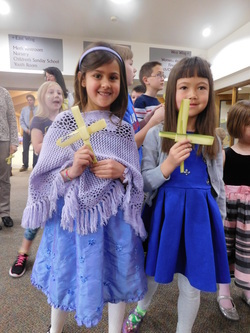 We take seriously the motto of our parent church, the Evangelical Lutheran Church in America: “God’s Work, Our Hands.” We take part in the Fort Collins Interfaith Council, the ClimateWise program, and community events like the St. Patrick’s Day parade. We support local organizations like the Homelessness Prevention Initiative, Crossroads Safehouse, Larimer County Food Bank, Lutheran Family Services, Sky Ranch Lutheran Camp, and CSU’s Lutheran Campus Ministry. Members volunteer at the Catholic Charities Mission monthly. Trinity also offers free annual community events for families, like a fall Pumpkinfest and spring Easter Egg hunt. A number of community groups, like Al-Anon and LFS Parenting Classes, use our space during the week. Additionally, we’re involved in global efforts like our permanent Fair Trade coffee kiosk and an annual “Stand with Africa” appeal in May. How can I get involved...without chairing a committee on my second visit? We believe that all people of faith are “ministers.” God gives each of us gifts and talents to use in service and love in our daily lives. The people of Trinity plan, lead and share ministries of all kinds. If you’d like to get involved, one place to start is here on the website—you can learn a little more about places to get involved at Trinity. But our goal is healthy, sustainable ministry shared by many—not the resentment and burnout that often follow a bad fit. So you’re also welcome to take your time, get to know us, try things out, or talk with one of the pastors about where your interests and abilities might match a ministry opportunity that inspires and fulfills you. Simply put, Lutherans are Christians—part of the one Church that includes all Christians of every time, place, and flavor. We believe in ONE God who is Father, Son, and Holy Spirit (the “Trinity” that gives us our name.) Lutheran Christians have a particular focus on GRACE: we trust in the good news of Jesus found in the Bible, which says God loves, accepts, and forgives us apart from our own efforts. Despite our sin and wrongdoing (and despite all our attempts to “earn” God’s favor), it is God’s choice, God’s action, God’s movement toward us that makes us whole. Jesus’ life, his death on the cross, and his resurrection all reveal a God who comes into the “real world” to bring life and hope out of death and evil. God’s grace frees us so that we can live joyfully and generously, in love and service to our neighbor.